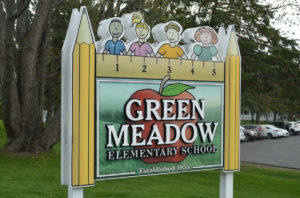 I’d like to wish all of our Green Meadow families a Happy New Year! I hope it is off to a great start! A big thank you goes out to our students, parents, and staff members that helped make the holiday season a brighter one for many families. Over the past couple of months we were able to donate food baskets to needy families, collect canned goods for CoNSERNS-U, and provide gifts for several adopted families. Soon our student council will kick off the “Soup-A-Bowl” food drive. Be on the lookout for more details soon! With winter upon us, I’d like to remind you that we try to go outside on a daily basis, unless it’s raining or the temperature is extremely cold. Please make sure your child comes to school dressed appropriately for outdoor winter play. All clothing items should be labeled with the child’s name. Many hats, mittens, and gloves look alike! If you are missing something, please have your child check the lost and found area in the front hall near the gym. I would also like to remind everyone that if you are bringing your child to school in the morning, please do not allow your child to cross the parking lot alone. There is a significant amount of vehicle traffic and I do not want anyone to get injured. Additionally, please do not drop your child off before 9:00 a.m. We do not have staff available to supervise children before this time. The EGCSD Transportation Department will be hosting its annual Winterfest this weekend, January 18th – 20th. There are many fun filled events planned for the entire community. Additional information is posted on the school district website. This event has been a success for years! Best wishes for a Healthy and Happy 2019!